Some 1,000 international students from 91 countries currently attend Boston College, a 30 percent increase in the past decade. The numbers are equally strong going in the other direction: According to Bernd Widdig, director of the University’s Office of International Programs, “nearly 40 percent of Boston College undergraduates participate in study abroad programs,” traveling to more than 50 countries. Many participants benefit from grants awarded by the University’s McGillycuddy-Logue Center for Undergraduate Global Studies, founded in 2008.
International Education Week, November 15-19, was organized on campus by the Office of International Students and Scholars and student organizations such as the International Club and the Graduate International Student Association. Its 32 events included lectures, art shows, and international food tastings prepared by Dining Services. 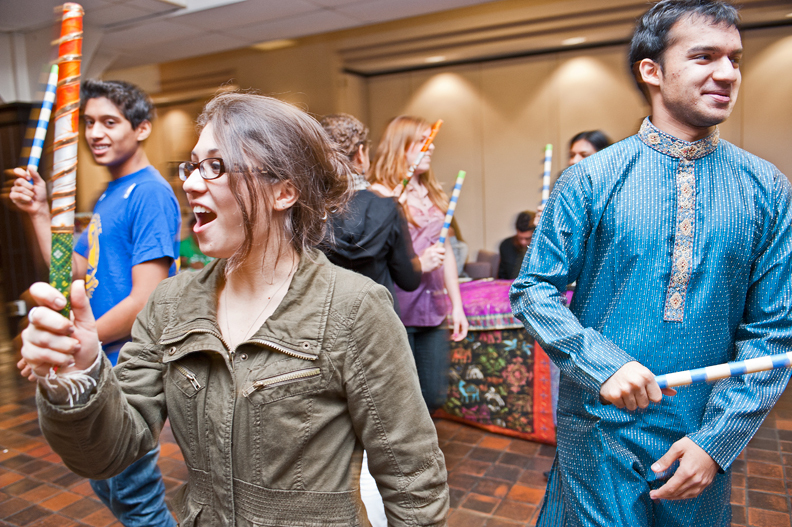 At a cultural showcase in Lyons Hall on November 17, students taught the Garba, a traditional Indian dance. Shown above, from left, are Rohit Verma ’14, Gloria Kostadinova’14, and Chirag Zaveri ’13. This feature was posted on Wednesday, November 24, 2010 and is filed under Featured Photo.